Angel Food Cake | KBK Bakery's Adventures in Baking! This recipe came together very easily and with no problems. The only thing I had was a large air bubble on the bottom, but that’s my own fault since I didn’t run a knife through the mix to get it out. Oh well, it baked well and tasted scrumptious! This classic sponge cake is thought to have originated with German settlers—a thrifty use of the many egg whites left over after making noodles. Apocryphal perhaps … delicious nonetheless. Put whites and water in a very clean large metal bowl and swirl over simmering water or a gas flame until barely warm. Sift together flour, 1/4 cup sugar, and ginger 4 times onto a sheet of wax paper. Beat whites in standing electric mixer on medium speed until frothy. Add vanilla, cream of tartar, and salt. Increase speed to medium-high and beat just until soft peaks begin to form. Gradually beat in remaining cup sugar, 2 tablespoons at a time, occasionally scraping down side of bowl. Increase speed to high and beat until stiff, glossy peaks form. (Do not overbeat.) Sift one third of flour mixture over whites. Beat on low speed just until blended. Sift and beat in remaining flour in 2 more batches. Gently pour batter into ungreased tube pan and smooth top. Run a rubber spatula or long knife through batter to eliminate any large air bubbles. Bake cake in lower third of oven until golden and a tester comes out clean, about 40 minutes. Remove cake from oven and immediately invert pan. (If pan has “legs,” stand it on those. Otherwise, place pan over neck of a bottle.) Cool cake completely, upside down.Turn pan right side up. Run a long, thin knife around outer edge of pan with a smooth (not sawing) motion. Do the same around center tube. Remove outer rim of pan and run knife under bottom of cake to release. Invert to release cake from tube, and invert again onto a serving plate. Serve cake with whipped cream and berries. 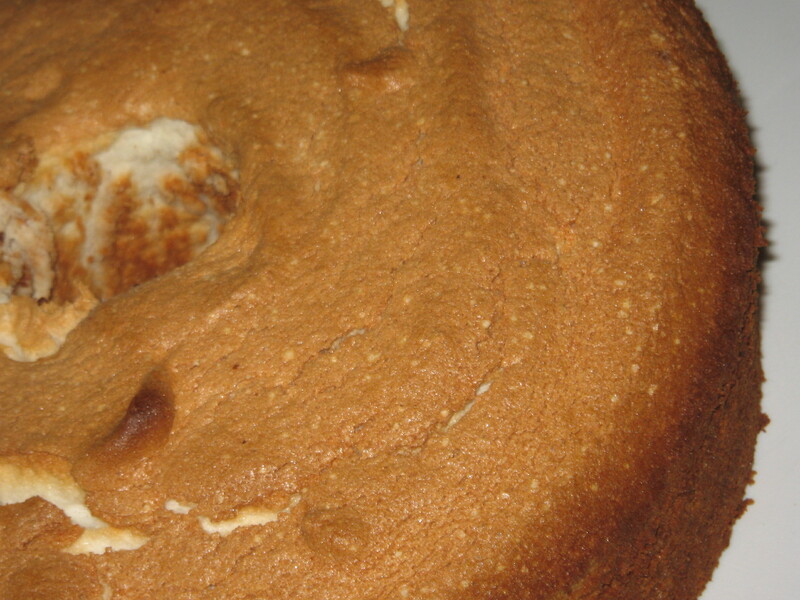 • Angel food cake was traditionally torn apart using 2 forks or a many-pronged cake breaker to preserve its prized texture; however, gently sawing with a modern serrated knife also works well. • Cake may be made 1 day ahead and kept, covered, at room temperature. Bake cake in lower third of oven until golden and a tester comes out clean, about 40 minutes. Remove cake from oven and immediately invert pan. (If pan has “legs,” stand it on those. Otherwise, place pan over neck of a bottle.) Cool cake completely, upside down. Turn pan right side up. Run a long, thin knife around outer edge of pan with a smooth (not sawing) motion. Do the same around center tube. Remove outer rim of pan and run knife under bottom of cake to release. Invert to release cake from tube, and invert again onto a serving plate.